South Asian activists came together to raise voice against the recent attack on Swami Agnivesh in India by Hindu extremists at Holland Park in Surrey on Sunday evening. Organized by the Indians Abroad for Pluralist India (IAPI), the rally was attended by people from diverse backgrounds. The speakers unanimously condemned the attack on Agnivesh and expressed their solidarity with the secularists who are being frequently targeted by the supporters of ruling Bharitya Janata Party (BJP). An associate of Aginvesh, Acharya S.P. Dwivedi – who is a Hindu preacher himself, was among the speakers. 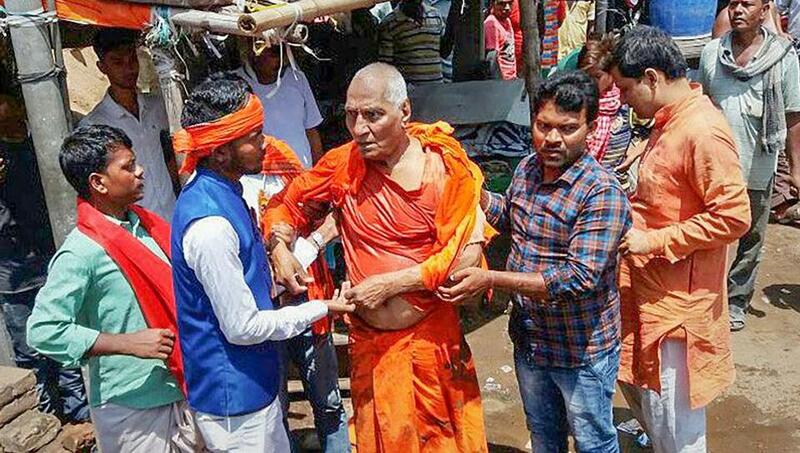 He pointed out that Agnivesh has always stood for minorities and those marginalised. He added that the assault on him was an attempt to suppress the voice of reason. The cofounder of IAPI Gurpreet Singh clarified that the mandate of IAPI isn’t just confined to opposing the BJP as it is also critical of the opposition Congress which has also played the politics of majoritarianism under the garb of secularism. Nevertheless, the organizers also condemned the attack on the office of a senior Congress leader Shashi Tharoor for cautioning against the attempts to turn India into Hindu theocracy by the BJP government. Others who spoke on the occasion were Muslim activists Sayed Wajahat and Imtiaz Popat, Dalit activists Roop Lal Gaddu and Rashpal Singh Bhardawaj, rationalist activists, Harjeet Daudhria, Avtar Gill, Parminder Kaur Swaich and Bhupinder Malhi and well known Sikh broadcaster Harpreet Singh. The demonstration coincided with the first anniversary of IAPI that was formed last year in response to growing attacks on religious minorities in India under BJP government.